Home/ Sal "The Voice", Haley, Landau, Piscopo & Damiani DO AC! Sal "The Voice" Valentinetti (America's Got Talent 2016), Landau Murphy Jr. (Winner of America's Got Talent - 2011), Haley Reinhart (American Idol 2011), Joe Piscopo (Saturday Night Live, Wise Guys, Johnny Dangerously) team up with Dave Damiani & The No Vacancy Orchestra for the only live orchestra show in Atlantic City. 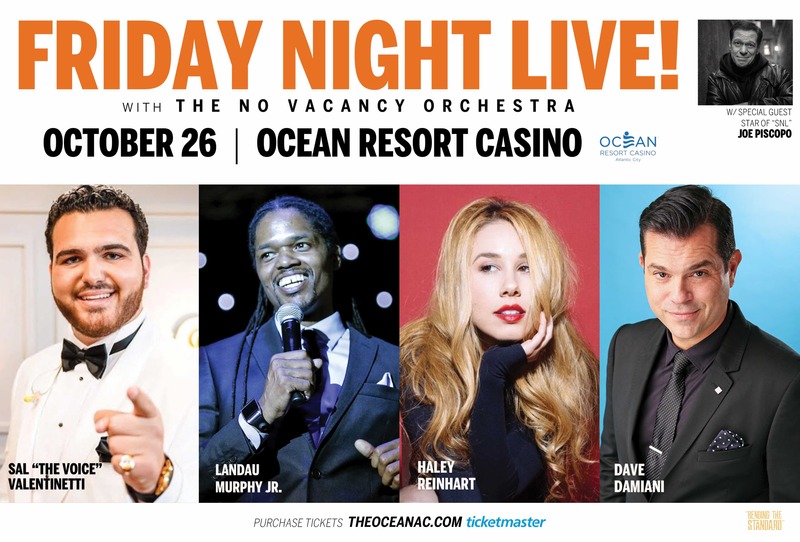 The brand new Ocean Resort Casino is teaming up with Dave Damiani & The No Vacancy Orchestra to bring the only live orchestra show to Atlantic City. Don't miss this special night in Ovation Hall! Get your tickets here for this star studded event! Click this link for tickets!! !